Ocean Isle Beach features seven miles of unspoiled beaches and is home to less than 600 year-round residents. Known for its quiet, less developed landscape, Ocean Isle is a great place to live for those seeking a lifestyle that is more low-key than high-energy. Traditional community is the hallmark of this quaint beach town, whose town motto is "Ocean Isle Beach: Unchanged." Visitors seeking a family-oriented, relaxing vacation spot will love this community, sometimes called "the Gem of the Brunswick County Beaches." Ocean Isle is refreshingly undeveloped in comparison to busier neighboring beaches. Instead of high rises and hectic traffic, you'll find appealing cottages and traditional family businesses. Ocean Isle Beach is also known for its yearly Oyster Festival and its proximity to other attractions, from famed golf courses to the signature seafood of Calabash, NC. All of these qualities make Ocean Isle an undiscovered gem amongst the beaches of the North Carolina coast. Ocean Isle Beach offers leisure activities for all ages and lifestyles. The mild climate and pristine shores lend themselves to outdoor leisure activities like water sports, boating, and fishing. You can stroll along the beach, build sandcastles, go for a sail, surf, or swim. There are more than 25 public beach access points available to visitors and residents, many featuring handicapped access. Visitors to Ocean Isle Beach will want to spend time on the historic Ocean Isle Beach Pier, originally constructed in 1956. Fishing enthusiasts can fish off the Ocean Isle Beach Pier and then enjoy a relaxing meal at the Grille, one of the island's landmark restaurants. Prefer deep-sea fishing? Take your boat, or charter one from several local companies, for a day that will be the envy of your fishing buddies. Fishing supplies can be bought at the Ocean Isle Fishing Center, so taking that spur of the moment fishing trip is convenient and fun. Or just enjoy an afternoon on the beach listening to the waves on the shore. Popular Ocean Isle Beach events include the North Carolina Oyster Festival, held yearly in October, which attracts more than 45,000 visitors. 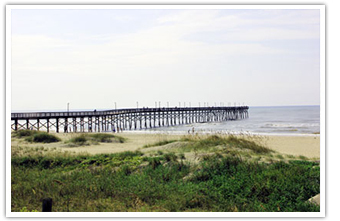 Nearby Calabash, NC is also famous for its signature seafood and delicious low country cuisine. To whet your thirst, just off the island, you'll find an award-winning winery, Silver Coast Wines. There are also plenty of attractions for visiting guests. Families with young children and grandchildren will enjoy the Museum of Coastal Carolina, the only museum on a North Carolina barrier island. Museum exhibits focus on coastal sea life, including turtles, whales, and sharks. The daily Touch Tank Feeding exhibit delights children of all ages, where they can hold a sea star and help museum staff feed the featured sea life. At the nearby Ingram Planetarium in Sunset Beach, NC, children can also participate in the Sky Theater show or step inside a "category one hurricane simulator" when visiting the Paul Dennis Science Hall. Music fans look forward to the free summer "Concerts on the Coast" series, held in the museum's parking lot, on Friday evenings from May to September. Featuring local bands, this series is a great introduction to southeastern North Carolina's famous "Carolina shag" dancing and signature beach music which originated during the swing era of the 1940s. The Ocean Isle Beach Turtle Patrol is a non-profit organization dedicated to community education and the protection of the endangered Logger Head turtles which are native to the area and nest on the beach from May to December. The Turtle Patrol offers weekly lectures and recruits volunteers from within the community to protect nests at night during hatching season. Fans of golf will be delighted to vacation or retire on Ocean Isle Beach, which is conveniently located within twenty miles of more than 25 public golf courses. Golf is one of the main leisure activities of the region, with more than 100 fine golf courses in southeastern North Carolina and South Carolina alone. The town of Ocean Isle Beach was incorporated in 1959 and has a town council and mayor. Residents of Ocean Isle Beach have municipal police, fire, water, sewer and sanitation services organized by the town council. The town's primary economy is based on its uniquely family-friendly and tasteful approach to beach tourism. In 2008, the American Shore and Beach Preservation Association named Ocean Isle Beach the winner of the "Best Restored Beach Award" for the town's efforts at beach preservation. Ocean Isle Beach's emphasis on community and family can be seen in the island's amenities for residents and their families, including the Ocean Isle Beach Community Center and the Museum of Coastal Carolina. Ocean Isle Beach is served by a ferry which docks at Ferry Landing Park. The Ocean Isle Beach Playground is also adjacent to the museum. If you're looking to retire to a quiet seaside community with a low cost of living, then Ocean Isle Beach is the place for you. In fact, Ocean Isle Beach was called one of "America's Best Beaches" by Terry Bradshaw on Today in America. As one resident who retired to Ocean Isle told the television program, "when you drive over the bridge, all your cares melt away." There are many amenities available for the retiree population, as retirees over 65 make up 32% percent of the island's population. After a day at the beach, Ocean Isle Beach offers an array of convenient restaurants, many with takeout and delivery options. Stop for a cool Italian ice treat, pick up some Jamaican jerk chicken, or choose an elegant dinner. Likewise, retirees can enjoy the quaint family-owned boutiques on Ocean Isle Beach or visit the nearby community of Shallotte for larger chains like Belk department store. Myrtle Beach, SC and Wilmington, NC offer an even wider array of high-end shopping destinations, less than an hour away. Nearby medical facilities offer state-of-the-art care and treatment options. Travel to Ocean Isle Beach is a breeze. Private planes can fly into the mainland Ocean Isle Beach airport, while neighboring Wilmington, NC and Myrtle Beach, SC both have conveniently located international airports. Ocean Isle Beach maintains a small-town feel year-round, with a permanent resident population of less than 600 people. While the population increases to 25,000 during the height of the summer season, residents will appreciate the quaint values of Ocean Isle Beach. Single-family homes with views of the ocean or the Intracoastal Waterway are the norm on the island, both for full-time residents and visitors seeking seasonal rental properties. Many luxury oceanfront homes and lots are available on Ocean Isle Beach and are far more affordable than similar homes on other area beaches. You can even design your own dream oceanfront home with help from the area's many custom home builders. Or, choose the marsh side of the island, which features beautiful views of the Intracoastal Waterway. Because of the island's compact size, homes on the Intracoastal are still only few blocks from the beach. Wherever you live on the island, you are a short walk away from public beach access points located at 500-ft. intervals along the shoreline. Many of the island's oceanfront homes also make excellent investment properties for part-time islanders and retirees. More than 70% of the island's real estate consists of single-family detached homes with an average of 2-7 bedrooms, so these homes make ideal seasonal rentals, too. Creating the summer home of your dreams can be a reality on Ocean Isle Beach. Ocean Isle Beach lacks the sprawling high-rise developments often seen at other American beaches. There is only one high-rise condominium community on the island, Ocean Point, which offers upscale amenities, large square footage, and a wonderful location. Some of Ocean Point's residents have both a sound and an ocean view. Whether you visit Ocean Isle Beach NC every summer or relocate here permanently, North Carolina's most "unchanged" barrier island offers beautiful beaches and a relaxed, family-friendly way of life that is sure to delight. To become a part of this wonderful community, please Contact Us today. Ready to Search for Ocean Isle Beach Homes for Sale?